C.S. Lewis, An Experiment in Criticism, 140. After emailing Amazon about [the lack of page numbers], and, like the previous poster, getting no response, I called. I could not believe the arrogance of Amazon’s position on this issue. The customer service representative I spoke with was very argumentative and held firm to the position that academia should “catch up with technology” and Amazon has no responsibility to address the page number issue because page numbers are antiquated. Her response to my concern was inappropriate–I definitely touched a nerve–and also indicated that she had heard this complaint before (probably multiple times). I think Amazon knows all too well about this issue and it doesn’t matter to them that they are alienating perhaps the most lucrative market (the academics) they could possible tap in to. If they want to just gear toward causal readers, that’s fine I suppose, but it’s unfortunate for us and ultimately for them too. I really hope they reconsider their position–the technology is amazing, but the way they are administering it just doesn’t work for me. 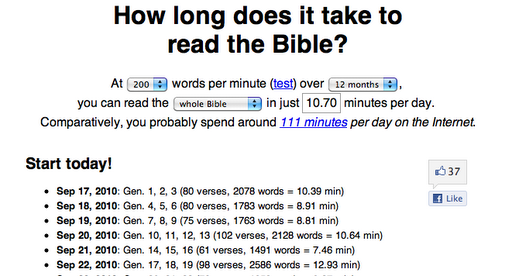 How long does it take the read the Bible? Jeannie: “Getting Gen Y’s Attention: 101″ “Even if I had the money to buy every textbook I ever needed in college, most of them would have collected dust on my shelves all semester. One could chalk it up to having a typical Millenial attention span –one that understands thoughts in 140 characters or less – but just like my textbooks, I don’t buy that. Part of my complete disinterest in textbooks comes from the fact that the second a book is published today, it is pretty much obsolete. Since I was in fifth grade, I have been able to access almost any information on the Internet more quickly and accurately than I ever could in a textbook. Furthermore, this online information is free (or if it’s not free, I’ll go look on another site until I find it for free). With a limited budget and unlimited free resources, is there any kind of textbook that could ever capture my interest?